1. Bring a large pot of heavily salted water to a boil for the lobsters, and another pot of salted water to a boil for the pasta. 2. On a cutting board, hold the lobster facing your knife hand. Place the point of a very sharp chef's knife on the lobster's head just behind the eyes. Swiftly press the point in, and bring the blade down to the cutting board, severing the head. The lobster will move and twitch, but it is no longer alive. 3. Pull the claws from the body, using a slight twisting motion, and add the claws to the lobster pot and cook for 5 minutes. Use a slotted spoon to remove the claws and let them cool slightly. When cool enough to handle, cover the claws with a kitchen towel and crack them by pressing down with a mallet or the handle of a chef's knife. Remove the meat from the claws and set aside in a bowl. 4. Remove the tail by twisting it in one direction and the body in the other. It should come apart cleanly. Set the tails aside. 5. Remove the meat from the knuckles (the segment between the claws and the body), and set aside in a separate bowl. 6. Cook the pasta for 1 minute less than the box directs for al dente. Reserve 1 cup of the cooking liquid from the pasta and drain the spaghetti in a colander. Put the pasta in a bowl and toss with 1 tablespoon of the olive oil. 7. 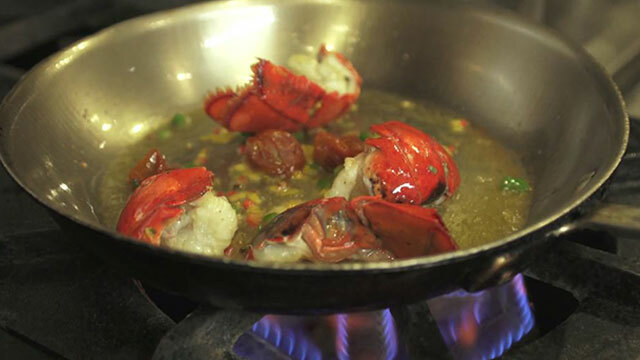 Pour the extra-virgin olive oil to a frying pan and heat it on medium heat, and cut the lobster tail in half lengthwise, and then cut each side again into small chunks. Then, season the uncooked portions of the lobster with salt and pepper. Saute the lobster in the frying pan. 8. Add the diced chiles, sliced garlic and some dried cherry tomatoes to the frying pan and let it cook. Then, add the tomato sauce. 9. Once everything is heated and cooked, add a bit of the pasta water to the frying pan. Add a little bit of salt and pepper, but be careful with the salt because the pasta water already has salt in it. 10. Allow the sauce to reduce. Then, add the al dente pasta to frying pan and mix, and finish cooking the pasta in the pan. Drizzle a bit of extra-virgin olive oil over the pasta, and add the chopped parsley and mix. 11. Plate it and top it with the sliced mint leaves.